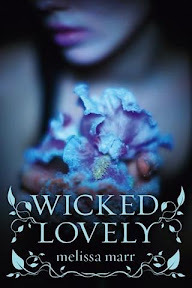 Wicked Lovely [Book Review] – my books. my life. Aislinn, like her mother and grandmother, sees faeries. She tries to ignore them as they pick on humans, who are oblivious to their presence. Until one of them, Keenan, the Summer King, sets his mind on having Aislinn for his long-searched-for Summer Queen. Bear with me. I am talking about faeries. Fey. A lot of you are probably groaning (or you’ve stopped reading by now). But trust me when I say that this book was GOOD. Like really good. Ask my husband. I wouldn’t stop talking about it while I was reading. Although he gave me a look that may be similar to the one you are currently wearing. Marr does a fantastic job setting up the mythology of the Summer King searching for his Summer Queen. It’s complex enough to be interesting but still possible to understand. As Aislinn gets caught up in the mystery and magic of the fey world, so does the reader. And neither the reader nor Aislinn is likely to escape it by then. And Seth. Can we talk about Seth for a minute? He’s so crush-worthy. He’s tattooed and pierced in a totally adorable way. And he’s so in love with Aislinn that I was actually a little jealous. Plus he lives in a train. That’s pretty awesome. This is a series, but I have heard that the other books involve other characters. I want to keep reading but I think I will miss these ones (I’m mostly talking about Seth if we want to be honest here). Maybe all of you who are going to read this book have already read it. But if you haven’t and you aren’t turned off by the word “faery” then go read it now. Haha! Yes, my eyes glaze over when reviews start talking about faeries. But I have heard over and over again about how wonderful this book is (especially on audio). So I could make an exception I think. Our library, as wonderful as it is, doesn’t have it on audio, but I’m going to try to figure out how to find it. I’m really relieved that you loved this! I was surprised at how much I enjoyed Wicked Lovely! I’m glad you liked it too. Your review is reminding me that I need to go back and read the rest of the books in the series! I am just discovering that I love paranormal books, and so my eyes didn’t glaze over the word faery, like they would have a few months before. This actually sounds like a really interesting series, and like one I should check out. I am really glad that you enjoyed it and now it’s going on my list! Completely agree. The fey-thing made me wonder if I should start reading it, but I am so glad I did. I haven’t tried the other books yet.. I listened to the entire series on audio and enjoyed it. Some books were stronger than others and I have to say that the two that were more centrally focussed on other characteres besides Aislinn/Seth/Keenan were my favorite. Having said that, these three were part of those books as well so you don’t completely lose track of them entirely. I’ll be interested to hear what you think of the rest once you get them read. Pingback: Stopping Time and Old Habits [Mini-Review] | my books. my life.